Thousands of quality BBQ parts at your fingertips! At The BBQ Depot, we understand what the right part or equipment can mean to you and your guests grilling experience. That is why we only stock OEM and after-market parts that will meet or exceed the quality of the original part. Browse by searching model number, part number, by brand or part-type. Once you find a potential replacement, be sure to examine the part's picture carefully in comparison to the original. If the dimensions are not close, don't buy the part, rather get in touch with our grill specialists. Can't find your grill's model number? If your model is not listed, there is still a good chance that you can find a replacement part with a dimensional search. If you still don't see your burner, you can probably replace it with an H or oval burner with a universal, adjustable venturi. The ignition lights the BBQ. It is made up the spark generator, collector box and ignition wires. Parts such as valves, knobs, and drip trays. The burners are where the flames come out of. They can be made of Brass, Stainless Steel or Cast Iron and come in many shapes. By keeping the holes surrounding the burner uniform and free from grease you will extend the life of the burner! 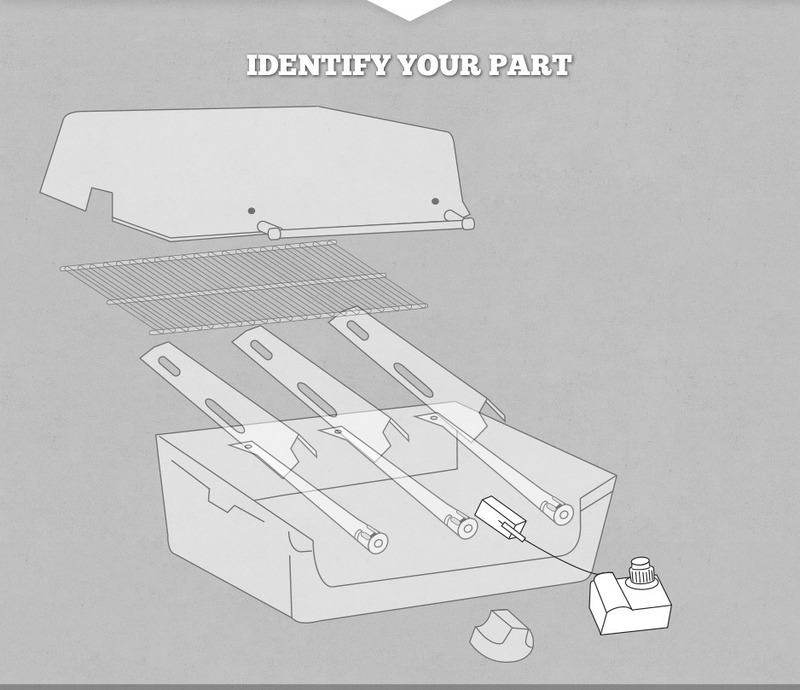 This is the main heat distribution system in your grill and evenly spread a flame across the cooking surface. We stock a number of heat angles, Briquette trays, Radiants, and rock grates. The Cooking Grates are the main surface where you rest your food to cook. Popular replacement part types include Burners, Briquette Trays, Heat Plates, Igniters, Cooking Grates, Valves, Knobs and more. Popular brands we carry include: Alfresco, Delta Heat, Lynx, Twin Eagles, Charbroil, Fire Magic, AOG, Jenn-Air, Charmglow, Ducane, Nexgrill & more. over 200 total. You may also speak with a Gas Grill Parts Specialist at 877-983-0451 for any BBQ questions you may have or use our live chat feature. If you reside in the local areas of South Florida and want to have your BBQ grill serviced, please read more about our grill service calls here.